Recorded live to 2-track, Frank Black has always loved to take risks, experiment, and pave the way for others to follow. With Black Letter Days he succeeds, doing the unimaginable and delivering a full-blown pop-rock record recorded on the most primitive of gear. When he could have recorded acoustic songs on the same gear and got away with it, or entered a bigger studio, he opted to stick to the basics, surprisingly to the benefit of the songs. Country-tingled pop songs and pop-rock songs sit side by side, the roots-y, raw recording style bringing to life the power of each song, forcing you to focus on Black's songwriting, rather than a producer's wizardry. Black's songwriting is in fine form, sounding as relevant today as it did when he was fronting The Pixies. Though he's missed a few steps over the way and delivered some less-than-stellar tracks, here he tests himself as well as the songs, both passing with flying colors. 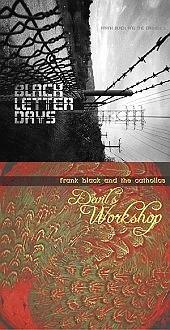 And if the eighteen tracks of Black Letter Days wasn't enough, Frank Black & The Catholics have recorded a second disc, Devil's Workshop, eleven more songs that prove the prolific Black still has it in him to make many more brilliant records. Devil's Workshop is the melodic bar-rock-pop ying to Black Letter Days pop and country yang. Devil's Workshop is a fine example of a man that has rock 'n' roll in his blood, but can step aside to do other things, but always come back to the rock without sounding rusty or tired. With twenty-nine songs between the two discs, Frank Black & The Catholics offer up plenty of sounds to please you. For some, this might be too much music (especially considering his incredible back catalog). But for someone of Black's talents, he pulls it off and, amazingly enough, leaves you asking, "Well, this is great. What's next? I want more". The unimaginable has happened. I'll give both an A-.